Get your movie game plan together with our Summer Movie Guide, where we'll give you the breakdown of what's opening when, why we're excited for some movies (and why we're not), and photos and trailers galore. 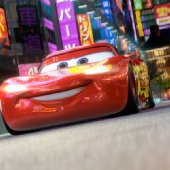 This weekend the Pixar autos go international in Cars 2, and Cameron Diaz is one seriously Bad Teacher. It's all in the Summer Movie Guide. Watch Live: Lindsay Lohan Violated Her Probation—Is She Finally Going to Jail?! Check out our recaps for some of the hottest shows on the air — beware of spoilers! Demián Bechir stars in director Chris Weitz's A Better Life, an exploration of the struggles of an immigrant father hoping to build a good life for his son while the dual threats of gangs and immigration agents loom large. Find out more in our Indie Film section. Sefton: Give that man a cupie doll. While filming in London in October 2010, Johnny Depp received a letter from a local 9-year old schoolgirl, telling him her classmates needed help to 'mutiny' against her teachers. He turned up with almost no warning at the school in full Sparrow outfit, but advised against mutiny..
Have an item you'd like to see featured on Hit List? Submit it here.